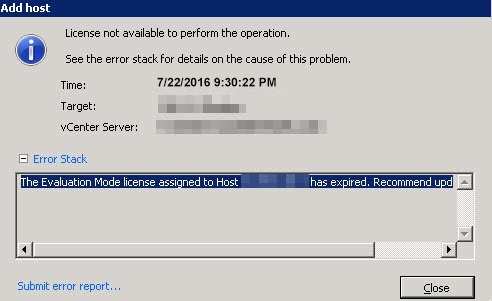 "The evaluation Mode license assigned to Host hostname has expired. Recommend updating the license"
As he was just configuring the lab so of course the trial period was not expired so what’s the issue here. The other thing which can cause this kind of issue is system date and time, there is a VMware kb# 2011655, which covers this issue. This issue occurs if the date and time in the BIOS is incorrect. When you add an ESXi/ESX host with an incorrect system time to vCenter Server, the license is converted to an evaluation license that immediately expires. 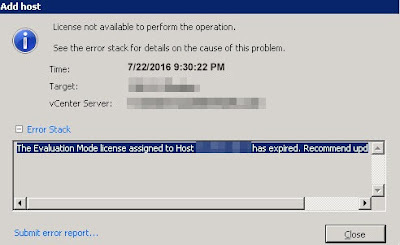 To resolve this issue, one need to correct the date and time in the host BIOS, once done then you will be able to add the host to the vCenter Server inventory.